The energy spectrum of cosmic rays is one of the main goals to investigate measuring extensive air showers (EAS) induced by ultra-high energy cosmic rays (UHECRs). Here we’ll give a short description of the present status of algorithms used to assign the primary energy to showers detected with the Yakutsk array and the methods used to reconstruct the spectrum. Special attention is paid to the total flux measurement of the Cherenkov light on the ground which is the basis of the model-independent approach to the energy evaluation of EAS original particle. Actually, the Yakutsk array has two kind of triggers to select the showers from the background: produced by the scintillators and by Cherenkov light detectors. The first one is operating when the coincident signal (particle density > 0.5 m-2) in two scintillators of each station within 2 microseconds occurs – the signal passes then on to the central controller. Trigger-500 is then produced in the case of coincident signal (in 40 μs) from three or more stations at ~500 m spacing. Similarly, trigger-1000 is produced by ~1 kilometer spacing stations. The second case is photomultiplier tube (PMT) detectors subset which has independent Cherenkov light trigger formed by three or more PMTs having detected light intensities above given threshold within 10 microseconds. The signal integration time of the individual PMT is 0.5 microseconds. The main distinctive feature of the Yakutsk array is the air Cherenkov light measurement. The total flux of the light emitted in atmosphere, Qtot, is used as the main estimator of the primary particle energy. 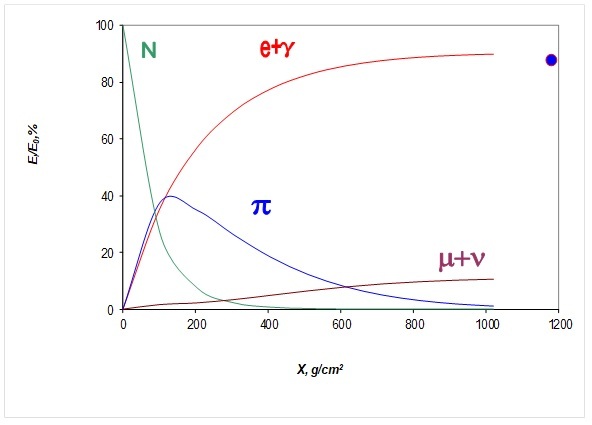 In order to derive the relation between Qtot and ionization loss of the shower electrons in atmosphere we have to use the classic formula by Frank & Tamm for the Cherenkov photons emitted when relativistic electron moves in air faster than light (phase velocity c/n). Resulting formula gives a relation between Qtot and ionization loss of the shower in atmosphere with parameters determined by detector sensitivity and atmospheric transparency factors inherent for the Yakutsk array. 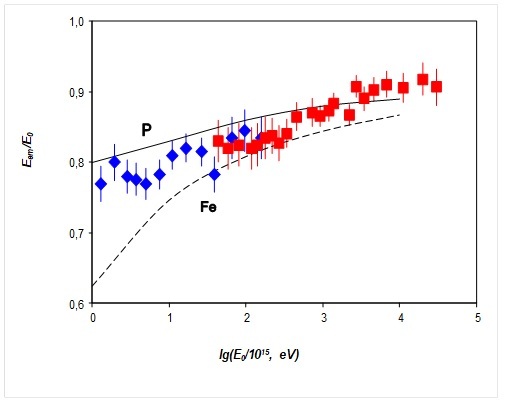 Estimated values of ionization loss Eem are shown in Figure together with model calculation results in the case of the primary proton (P) and iron nucleus (Fe). Other portions of the energy carried out by electromagnetic and muonic components beyond the detector level is evaluated using the total number of electrons and muons measured on the ground. Residuary energy fractions transferred to neutrinos, hadrons, etc. (illustrated in Figure), unmeasurable with this array, are estimated along model calculations. In this procedure only about 5% of the primary energy is evaluated using model assumptions. That is why we consider the energy estimation algorithm in use in the Yakutsk group to be model-independent in the first approximation. To derive the array acceptance equal to the product of array area, observation periods duration and solid angle, we have used the real duration of the array duty time periods; and have calculated the shower triggering area as a function of energy and zenith angle; solid angle = p. The array configuration has been changed several times since 1974; the actual perimeter was used for each particular time period. For the highest-energy showers the extended perimeter was applied. In this case the array area is increased 1.4 times while the shower parameters reconstruction is still possible with acceptable error. 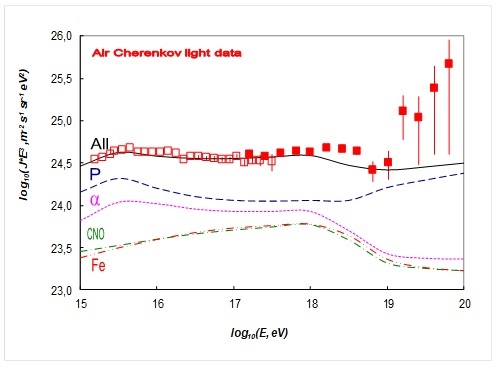 In addition to the charged particle detection on the ground, we have another technique at the Yakutsk array – the air Cherenkov light measurement, which can be used to draw out the CR spectrum in the independent way. The Cherenkov detector sub-array is covering only about 3 square km area, while scintillator stations can measure the spectrum at the highest energies. The resulting differential all-particle spectrum of cosmic rays is given in Figure in comparison with the Yakutsk array spectrum derived from the charged particle measurements under trigger-500 and trigger-1000 within array area, and within extended array area for the events of the highest energies selected with trigger-1000. Two spectra of the Yakutsk array are compatible within errors above 1 EeV but diverge at lower energies. Possible reason of a discrepancy is systematic error in primary energy estimation near the scintillator threshold of the trigger-500. We confirm with both datasets analysis the existence of an ‘ankle’ feature in the shape of spectrum below 10 EeV, i.e. the flattening in the spectral index revealed earlier by all the groups working in this energy range. At the highest energy end of the spectrum we still have a deficit in agreement with the expected GZK cutoff due to interactions of CRs with relic microwave background. The Cherenkov light detector data is compatible with a well-known ‘knee’ feature of spectrum at ~3 PeV. Two irregularities of the measured spectrum – the ‘knee’ and the ‘dip’ can be explained in the model of anomalous diffusion of galactic cosmic rays in fractal interstellar medium as was shown by Lagutin et al. Resulting spectra of the primary nuclei groups are shown by curves in Fig. 3, together with the total spectrum marked ‘All’. Comparison of our results (triangles – scintillator data, squares – Cherenkov light data) with other spectra measured with AGASA (circles), Auger (crosses) and HiRes (rhombuses) arrays is shown in Fig. 2. In the energy range below 1 EeV intensities are highest of the Yakutsk array data. Most likely it is due to different energy estimation technique used in three cases – resultant energies diverge. 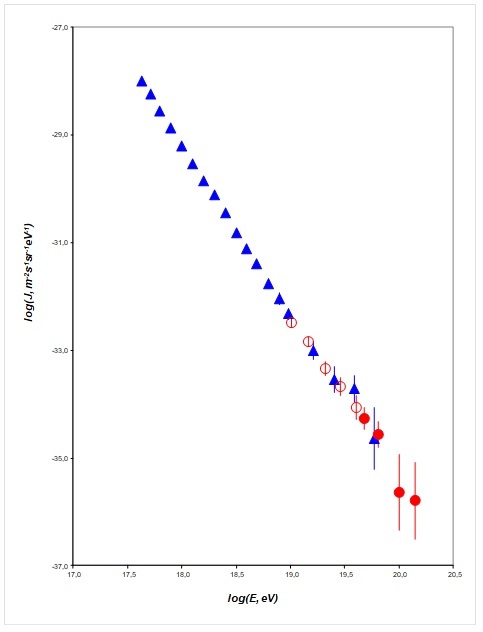 In AGASA case the model dependent relation between S600 and E is used; HiRes team measures the fluorescence light flux which is connected to ionization loss of electrons in atmosphere; both methods are used by Pierre Auger Observatory. Our estimation for vertical showers gives energy higher than model calculations by (30-40)% at E~0.5 EeV and by (15-20)% at E~50 EeV. 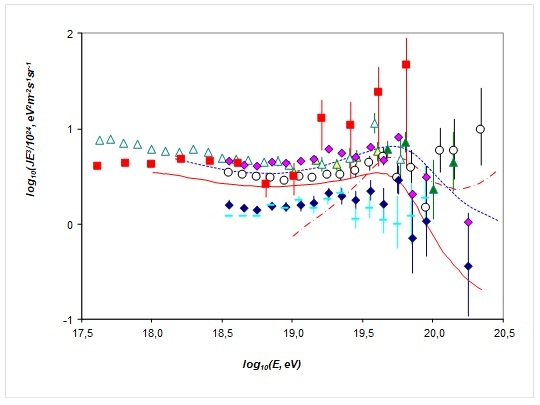 The spectrum tail above 10 EeV measured with scintillators is consistent with the GZK cutoff contrary to AGASA result, although the statistical significance of this conclusion is insufficient due to a few showers detected in the highest energy domain.